Businesses like Peloton are going straight from design, to prototype, to production-ready parts with the efficient and cost-effective systems from MakerBot. Established in 2014, the startup came into the market with a sleek, silent exercise bike that could also livestream classes over Wi-Fi and a built-in touchscreen. This connected approach to exercise, Peloton brought something new to the fitness and health industry and needed to speed up product development cycles in order to maintain its reputation amongst competitors and consumers. Peloton’s industrial design team adopted MakerBot’s 3D printing systems in order to prototype quickly and cost-effectively. 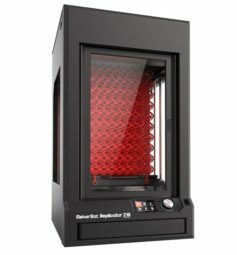 They were able to design over 20 different parts on their MakerBot Replicator series and over the years have saved over $20,000 in costs and a few months in production time. Beyond cutting costs and saving time, the industrial design team at Peloton also used their MakerBot to verify ergonomic placement, scale, and sizing as most, if not all, plastic parts of the bike were prototyped first on the MakerBot.